NETWORK UPDATE: As expected, ABC adjusted downward when its local football simulcasts were removed, with DANCING WITH THE STARS at 1.8 (down 0.4 from last week) and the season premiere of CASTLE at 2.2, the same as last season’s premiere. Both the new episode of THE BIG BANG THEORY and SCORPION gained 0.1 in final numbers, as did THE VOICE. MONDAY NIGHT FOOTBALL on ESPN towered over almost everything else on either broadcast or cable last night (even beating the fresh episode of THE BIG BANG THEORY), up 0.15 from last week’s game to 5.31. WWE (USA) followed at 1.40-1.46 over its 3 hours, up roughly a tenth. 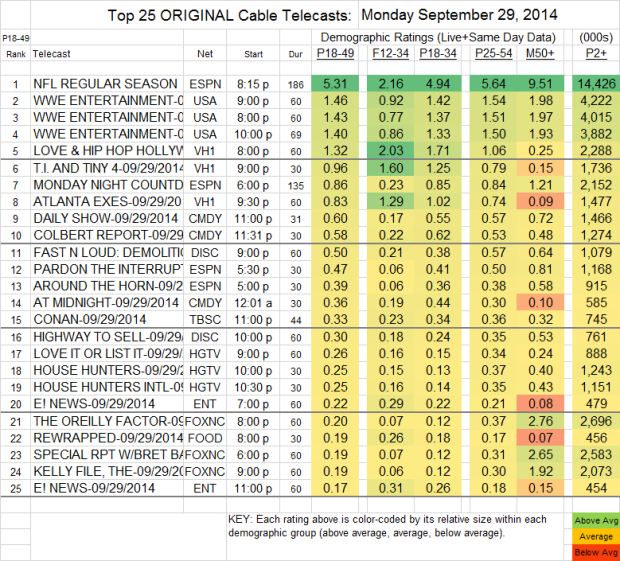 On VH1, LOVE & HIP-HOP HOLLYWOOD gained 0.07 to 1.32, while TI & TINY remained at 0.96 and ATLANTA EXES rose 0.04 to 0.83. FAST N LOUD (Discovery), for unknown reasons, crashed by 0.35 from last week to 0.50.